Edinburgh, the UK’s leading International meetings destination outside of London, has announced a solid start to 2017 with five new bid wins equating to 3,400 delegates and serving over £7M to the local economy. In conjunction with its members, Convention Edinburgh – the organisation responsible for promoting Edinburgh as a premier conference, events and meeting destination – has released details of the large-scale events that will help the Capital city maintain its world class status. Recent confirmed wins include the European Group for Organisational Studies Colloquium (EGOS) taking place in July 2019 with 1,200 delegates expected and bringing a total of £4M in economic benefit to the city. In April 2018, the International Research Society for Public Management (IRSPM) will host their 22nd annual conference in Edinburgh in April 2018 bringing £732K to the city with 600 delegates. On a similar scale, Eurocities will host its conference in November 2018 bringing 500 delegates and £977K to the economy. Currently ranked 35 in the world’s city rankings by International Congress and Convention Association (ICCA) and a member of BestCities Global Alliance, Edinburgh offers undisputed standards of excellence for hosting high profile conference and events. Constantly evolving its facilities to further strengthen its offering, recent developments include the revamp of Edinburgh First’s McEwan Hall, part of the University of Edinburgh, which is undergoing a multi-million-pound renovation to transform the historic venue, due to re-open this summer. £25M is also being invested to revamp the 1935 bandstand in Edinburgh’s West Princes Street Gardens to create a 3,000-seat concert and event venue space with a new pavilion, café and visitor centre that will be completed in December 2019. “We’re off to a really strong start for 2017 and can only see this strengthening over the remainder of the year. Despite challenges and uncertainties brought about by Brexit, it’s great to see Edinburgh consistently attracting high-profile events and conferences. The city is truly cementing itself as a global competitor. Edinburgh, 6 July 2016 – The Edinburgh International Conference Centre (EICC) won the hotly-contested industry award for ‘Best Conference Venue for over 900 Delegates’ at the 7th annual Conference Awards at Tobacco Dock, London on Friday 1st July. Scotland’s leading conference venue beat off competition from some of the world’s top venues – including the Abu Dhabi National Exhibition Centre and ExCeL London, to land the award for the first time. Marshall Dallas, the EICC’s Chief Executive, said: Marshall Dallas, the EICC’s Chief Executive, said: “When you look at some of the names we were up against this year, it’s a definite sign of how far we have progressed as a team and as a venue over the last 24 months. Industry events, such as the Conference Awards, are a powerful reflection of how the EICC has become a leading force within the global events market – and that really comes down to the investment we have made in our facilities, our technology and the incredible people who make up this amazing team we have here at EICC. 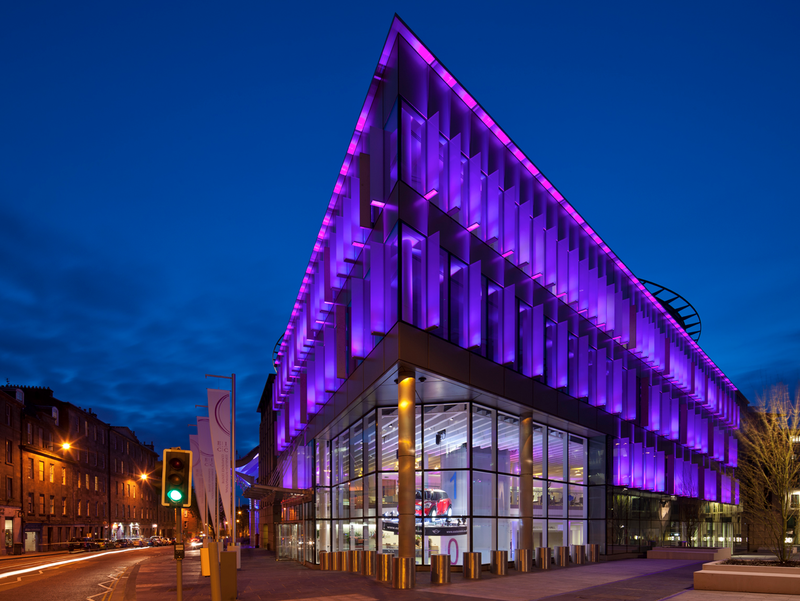 The EICC experienced its busiest year in 2015 hosting 139 business events for the corporate and association markets. 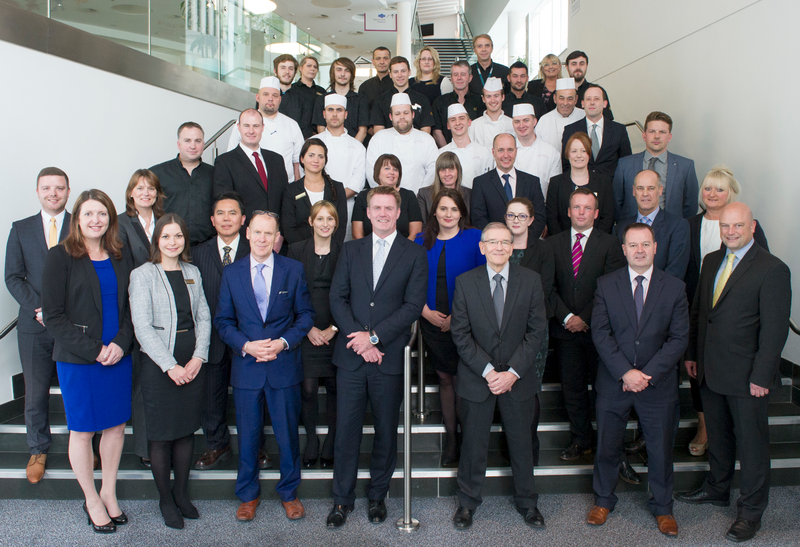 Highlights in the 2015 calendar included HRH The Princess Royal officially opening the Lennox Suite in January and George Clooney attending the UK’s largest business dinner ever in November when over 2,000 people dined alongside some of the biggest names in British business and entertainment in the heart of Edinburgh. About EICC – opened in 1995, the remit of the Edinburgh International Conference Centre (EICC) is to drive economic impact to the city and to date has helped to deliver around £500 million to the local economy while hosting over one million delegates and 3,000 conferences. The EICC is owned by City of Edinburgh Council (CEC) and operates at arm’s length as an independent commercial venture. Edinburgh is the highest ranked UK conference destination outside London according to leading global industry body, the International Congress and Convention Association (ICCA). About Lennox Suite – the multi-purpose Lennox Suite was opened in May 2013. The Suite is the key part of a £35 million expansion at the EICC which focused on adding industry-leading technology and functionality, the expanded space features moving floor technology which can be easily configured to multiple set-ups – options include banqueting or arena mode for 1,400 people or a tiered auditorium for 2,000 people. The redevelopment has improved the EICC’s ability to attract even more international conferences to Edinburgh. South Africa National Convention Bureau (SANCB) is celebrating South Africa’s 20 years of democracy at EIBTM this year, by reflecting on the significant growth of the business events industry on the African continent. South African Tourism, the official destination marketing organisation of South Africa, is also honouring the tenth anniversary of Meetings Africa (www.meetingsafrica.co.za), an event dedicated to showcasing Africa’s diverse offering of services and products. The tenth edition of Meetings Africa, hosted by the SANCB (a business unit of South African Tourism) is taking place at the Sandton Convention Centre, in Johannesburg from the 23rd to the 25th of February, 2015. Meetings Africa is the primary and most important platform, facilitating the growth of Africa in the business events market. The show will continue with its theme; Advancing Africa Together and the first day has been reserved for a number of workshops and seminars, dedicated towards driving the industry forward in the region. This tenth anniversary of the Meetings Africa will not only mark a key industry milestone for South Africa as a meetings industry destination, but it will once again highlight the SANCB’s central and critical role in continental collaboration. Through continued partnerships, Meetings Africa aims to contribute towards the empowerment of the African continent for future economic beneficiation. “Meetings Africa is where global buyers and exhibitors from all over the African continent meet, organise business events and in doing so help drive Africa’s, knowledge economy forward,” says Mr Thulani Nzima, Chief Executive Officer at South African Tourism. “Last year South Africa hosted 118 meetings that met the ICCA’s criteria (up from 97 in 2012) marking a significant 18 percent improvement in this regard. The 118 meetings brought over 94 000 association professionals to South Africa and contributed an estimated R1,5 billion to our economy. Our event pipeline going forward continues to look extremely positive. We already have 143 association conferences and events confirmed between now and 2017,” Nzima continues. Africa continues to grow its list of accolades and achievements, the latest addition to the list being the election of Nina Freysen-Pretorius as President of the International Congress and Convention Association (ICCA) as well Amanda Kotze-Nhlapo (the Chief Conventions Bureau Officer at the SANCB), as the Geographical Representative for Africa to the ICCA Board. “Having two South Africans on the ICCA Board, one at the helm, is a major boost for South Africa’s reputation as a business events destination. It is proof that we have the skills, insight and leadership capability to grow and develop the business events sector, not only in South Africa but globally. As the first African president of ICCA, Nina’s appointment marks a major milestone on the road to establishing Africa as a business events destination of choice. She has been given the responsibility of leading a highly influential, global body,” adds Nzima. “It is a huge honour for me to be given this opportunity to help contribute towards a thriving African business events Industry,” says Amanda Kotze-Nhlapo. “South Africa is an exceptionally capable, infrastructure-rich, experienced, cost- effective, welcoming and globally competitive business events destination. We have successfully hosted some of the world’s biggest sporting events and conferences including the rugby and cricket World Cups, the World Summit on Sustainable Development and the World Conference against Racism,” continues Nzima. Over the last 20 years, South Africa has seen a huge increase in inbound business. The destination continues to welcome delegates from all over the world, attending meetings, conferences, exhibitions and corporate incentive programmes. “We are very proud of how far South Africa has come in terms of building its business events reputation and capability. We also acknowledge and recognise the potential for future growth of this sector on the continent,” concludes Nzima. AIBTM is the premier global exhibition for the U.S. incentive, business travel, meetings and events industry. AIBTM brings together the world’s meetings, incentive, business and corporate planners for three days of focused business. This year’s AIBTM America Meetings Week will be taking place from June 19th – June 21st and will deliver a fantastic range of unparalleled learning and thought provoking education, exciting networking opportunities and offer powerful business connections for attendees of the show. AIBTM 2012, is expecting 20,000 pre-scheduled onsite appointments and there is a confirmed 71% increase in Group Co-ordinators over last year. The success of the inaugural event for exhibitors has led to 85% returning for 2012. Of these, 30% have increased their floor space significantly. PCMA Strategic Partnership – AIBTM 2012 has signed a major strategic partnership agreement with PCMA (Professional Convention Management Association) and will be the only exhibition organiser recognised at this level by PCMA. As part of this exclusive partnership, PCMA is on track to deliver over 500 Hosted Buyers this year. The partnership with PCMA will also facilitate a ‘State of the Industry Debate’ where the sessions will include keynote speakers to talk about relevant cutting edge topics, as well as an “Executive Edge Programme” which sees PCMA’s partnership with leading business schools to provide industry-relevant MBA educational opportunities. SITE Partnership – A major new partnership with SITE (Society of Incentive Travel Executives) is on target to deliver 100 incentive buyers. AIBTM will also run SITE’s Young Leaders Programme which is designed to build the next generation of motivational leaders by providing education and networking opportunities that appeal directly to the younger generation. New to AIBTM – Business and Corporate Travel Sector – AIBTM is dedicated to providing Business travel products, services and solutions to an audience of budget holding executives. The enhanced partnership with ACTE (Association of Corporate Travel Executives) at this year’s show will deliver a dedicated educational track focusing on how industry professionals can make the most of face time while developing technology to best enhance the corporate travel experience. ACTE Partnership – AIBTM 2012’s Partnership with ACTE will deliver significantly greater exposure to the Corporate & Business Travel Industry. This new collaboration with ACTE will provide an educational track of sessions relevant to face-to-face meetings in the context of business travel. ACTE’s focus will be on how industry professionals can make the most of developing technology to best enhance the corporate travel experience. ICCA Partnership – This year, ICCA (International Congress and Convention Association) will present an educational track at the show for the first time. The ICCA Global Meetings track will feature two 90-minute roundtable sessions as well as a one-hour clinic where ICCA members will be able to provide personalised advice for planners. MPI Partnership – MPI will deliver a series of education tracks which will cover the final installment of BVOM (Business Value of Meetings) which was launched in 2011 and supported by AIBTM. CSPI Partnership – Convention Service Professionals (CSPI) and AIBTM will be working together in an enhanced partnership for the 2012 event. CSPI will help promote AIBTM through print pieces, presence on their website and e-newsletters and give recognition as a sponsor at their conference. CSPI (formerly ACME) is dedicated to fostering the spirit of collaborative success between convention centre sales professionals and their convention sales counterparts at regional destination marketing organisations. Market Focus SPOTLIGHT on Europe – AIBTM 2012 is delivering a special Market Focus on Europe in which European exhibitors can benefit from a new networking opportunity to meet with Hosted Buyers who have a specific interest in hosting meetings and placing business in Europe. European Exhibitors will be able to meet with key U.S buyers during the hour long session. Hosted Buyers who have selected Europe as a preferred destination in their application to register will automatically have this networking hour in their pre-scheduled diary of appointments. Increase in Hosted Buyer Group Coordinators – This year’s AIBTM has 71% more Group Coordinators signed than AIBTM 2011 and is still in pre-registration phase for the Hosted Buyer Programme. New Exhibitors – AIBTM is delighted to welcome over 43 new exhibitors to this year’s show. New Future Events Experience – Following a successful debut at EIBTM, the Future Events Experience run in conjunction with Newtonstrand, Sync Partners and RTE will be introduced at AIBTM 2012. Exhibitors will have the opportunity to showcase their latest technology or services to all attendees in an interactive experience on the show floor. The Future Events Experience allows attendees to play, touch, feel and experience the most cutting edge technology in an environment that demonstrates how technology will influence and play a major role in the future of the meetings and events industry. The AIBTM Hosted Buyer Programme is a unique component of the show, which provides top-level buyers an opportunity to meet with the exhibitors of their choice for focused one-on-one appointments. The programme hosts International Buyers from across the globe, regional meeting planners from North America and local planners from around the Baltimore and Washington areas. Qualified buyers can benefit from the buyer-driven appointment system, opportunities to build their network of industry professionals and suppliers, dedicated educational sessions to expand necessary skills and knowledge, complimentary travel/accommodation, admittance to exclusive AIBTM networking functions including an exclusive Hosted Buyer networking evening at Baltimore’s new Four Seasons hotel (situated at the edge of Baltimore’s Harbour East waterfront) and events as well as access to two VIP Hosted Buyer Lounges. The Hosted Buyer programme and applications are split by three categories, Corporate, Agency and Association. The different categories ensure that buyers are provided with a business and education programme, which is dedicated specifically to their business requirements. The Hosted Buyers programme is specifically designed to allow flexibility for buyers attending ensuring each buyer has appropriate resources required to attend both the Education and Trade Show days. Buyers also have the option to stay an additional night so that they can take full advantage of the programme. A list of AIBTM Hosted Buyers can be found at www.aibtm.com on the home page. This year’s Hosted Buyer’s Ice Breaker will take place on Monday 18th June from 5:30PM to 7:30PM at the new Four Seasons, Baltimore and will provide Hosted Buyers at the show with an opportunity to network with others in the programme. The new and luxurious Four Season Baltimore opened up in November 2011 and has an impressive 256 rooms and suites with harbour, marina and city-scape views , 121 foot infinity-edged outdoor pool and 10,200 square foot spa. The Welcome Reception will take place on Tuesday 19th June at Power Plant Live near the Wharf in the Inner Harbour area. The theme will be a “fun filled street party” in one of Baltimore’s liveliest hot-spots. A variety of restaurants and bars will be open to all AIBTM attendees and exhibitors including: Luckie’s Tavern, Luckie’s Liquors, Leinenkugel’s Beer Garden, Mosaic, Mex Tequila Bar, PBR Baltimore, Angels Rock Bar and Joe Squared. Each bar/restaurant will be offering an AIBTM special signature cocktail. Plus, entertainment will be provided by the exciting Who’s Bad: Michael Jackson Tribute referred to as none other than the ‘ the ultimate MJ tribute band’. The Baltimore Convention Centre (BCC) recycling programme is single stream. Attendees can put any materials into the one container: paper, plastic, aluminium cans. There are marked cans throughout the building and on the show floor. Food waste is recycled through the Somat machine. Join AIBTM on Visit us at Linked in, Facebook, Twitter and Youtube.